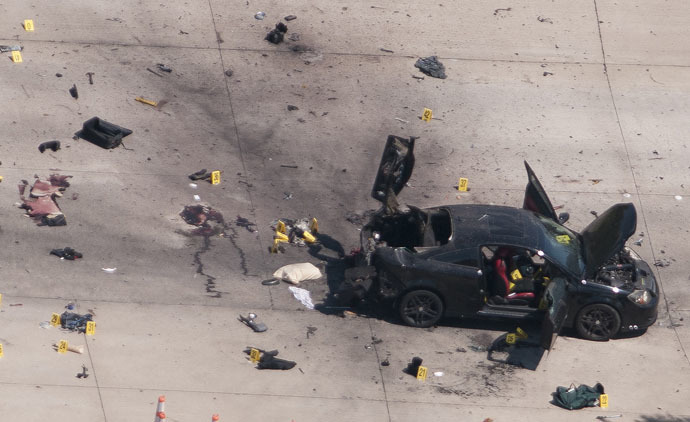 JNN 05 May 2015 Washington : The Notorious Terrorist Organisation Islamic State ,which emerged from Syria and Iraq , has reportedly declared it was behind the attack in Garland, Texas, via its Al Bayan radio station. The Islamic State (IS, formerly ISIS) made a statement on Tuesday, claiming this was the terrorist group’s first attack on US soil. The IS added that two of its “soldiers” had attempted to carry out an attack as the exhibit was “portraying negative pictures of the Prophet Mohammed,” AFP reported. Both gunman were shot and killed in a parking lot outside the venue, which was hosting a Blasphemous Cartoon Competition , depicting images of the Prophet Mohammed PBUH. The shooters were named as roommates Elton Simpson and Nadir Soofi, from Phoenix. It emerged that Simpson had been under surveillance since 2006. In 2011, he was convicted of committing a terror-related offense after lying to FBI agents about his desire to travel to Somalia and join jihadist militia. Two social media accounts, which had possible links to the Islamic State (IS), posted messages referring to Sunday’s attacks before they were carried out. A Twitter account under the name “Shariah is Light” posted a message with the hashtag #texasattack at 18.35 Central Time. An image on the account featured American-born jihadist Anwar al-Awlaki, who was killed in 2011 in Yemen by a drone attack. The Shariah is Light account subsequently attempted to follow a second account “AbuHussainAlBritani.” This second account posted a number of messages referring to the shooting in Texas and appeared to imply that IS was behind it. One of the tweets said that “2 of our brothers just opened fire” at the Prophet Muhammad art exhibition in Texas. The incident unfolded when a car drove up towards an indoor arena in Garland, where in the region of 200 people had been attending the exhibit, which offered a $10,000 first prize for the best artwork or cartoon depicting the prophet. The event was organized by the American Freedom Defense Initiative (AFDI), which is led by Pamala Geller, a critic of Islam. It emerged that the AFDI paid $10,000 for extra security and protection. Geller’s organization decided to create the ‘Mohammed Art Exhibition and Contest’ following the Charlie Hebdo massacre in Paris in January after the satirical magazine had published cartoons mocking the Prophet. Last week, two Democrat lawmakers had asked President Barack Obama to prevent the far-right politician from being allowed to enter the US for his anti-Muslim views. Before speaking in Texas, he had met with Republican Senators Louie Gohmert and Steve King. it should be Precisely Noted here that the Advocates of Free Speech Wants liberty in their Hate Speech against Islam and Muslims , but at the same time , they are not Brave enough to utter a Word about the Holocaust , as there the Limit of free Speech Ends , as it Hurts the Sentiments and the Interests of the Masters of the Zionism, where even Israelis and Jews are not even allowed to speak any thing against it , as now it is also on Record that there are thousands of Jews , who are against the False stories of Holocaust and Devilish Work of the Zionist Think Tanks. Such attacks indicates that another Secret CIA & Mossad Operation is in the offing on the Pattern of 911 attacks , in which Thousand of US Citizens were Massacared , To fulfil the Zionist Dream of Ruling the World , as it is losing the Ground each Passing Moment , Like Sand slips from a Pinhole of a Tightly Closed Grip. This entry was posted in America, Jafria, Middle East, United States and tagged America, Blasphemous Cartoons, Elton Simpson, Garland, Iraq, IS terrorists, Islamic State, Notorious Terrorist Organisation Islamic State, Pamala Geller, Syria, Terrorists, Texas, us, US Soil. Bookmark the permalink.